Want to know a fun fact about Redwood Grove, one of our 25 restoration sites? So how do we “restore” native habitat to a grove of redwoods growing in a historic valley oak riparian community? Contrary to what one might assume, our goal at Grassroots Ecology is not simply to restore land back to what it was in the past. Rather, we work to restore habitat to a state of health and balance that can be sustained into the future with minimal intervention. Healthy habitat is characterized by a high diversity of locally native plant and animal species that are part of a complex web of interrelationships. This biodiversity helps ensure the land (and the wildlife it supports) is resilient to drought, climate change, storms, or whatever environmental challenges are thrown its way. So what does restoration look like at Redwood Grove? 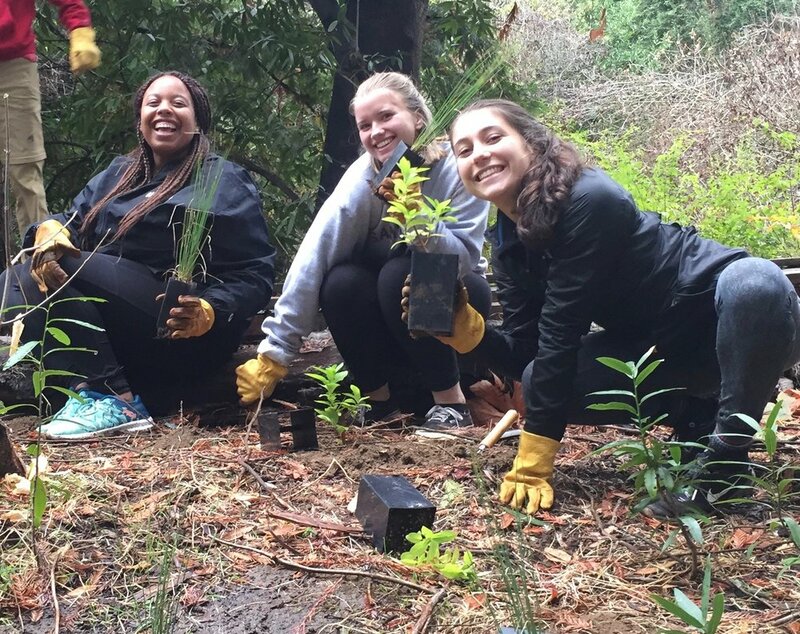 Beneath the redwoods, we are working with volunteers to plant and nurture a diversity of native understory plants that grow well in deep shade such as redwood sorrel, snowberry, and piggyback plant. We also focus on the health and bank stabilization of Adobe creek. By bringing back willows and other creekside species along this riparian corridor, we are combating erosion and compaction and creating a space to let the creek move in its natural form. In the sunny grasslands and oak riparian areas outside of the redwood canopy, we are planting native shrubs, bunch grasses, and flowers that grow well in full sun and/or under our native oaks, buckeyes, and other trees. We are also caging young buckeye and oak saplings to ensure they continue to grow into mature trees that can support a multitude of native insect and bird species. Between November and February, we planted 835 plants with the help of hundreds of volunteers of all ages. Now as we head into spring and summer, our focus will shift to watering, mulching, and weeding around these natives plants to ensure their successful establishment. Redwood Grove is a prime example of how we can fuse our understanding of the ecological past and present to create a vibrant and robust ecosystem, one that can serve our local community and our wildlife into perpetuity. After all, we all are part of the same ecosystem.